The first struggle for Independence, resulted in the overthrow of the British and the installation of an Indian elite that took over the exploitative systems of the erstwhile Raj. 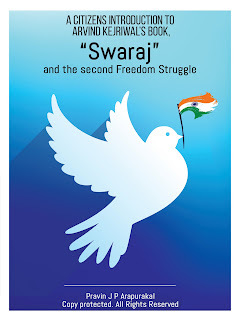 Swaraj, by Arvind Kejriwal is a clarion call to all Indians who care for the Nation’s well-being to join in a “second Independence struggle”. With the goal of bringing real power to local communities in India. Swaraj starts with insightful examples of loss to the Nation when leaders are corrupt. 1: The people of India at the national, State, District or Panchayat level have no control over government employees, policies and natural resources. Even local decisions are taken without allowing for local needs and conditions. Kejriwal goes on to cite cases where the people’s resources are wasted. 2: Multinationals have bought their way into the highest circles of government. This impacts not only areas like investment or tax policy but also allows multinationals to get away with minimal punitive damages levied on errant companies like Union Carbide in Bhopal whose carelessness led to severe loss of life. 3: India’s natural resources like Iron, Bauxite, Coal etc. are being plundered by corrupt businesses, who suborn politicians and bureaucrats. One example is the paltry Rs 27 per ton that the government receives for iron ore mined. This ore is sold then sold by the mining company for up to Rs 6,000 per ton after spending around Rs 300 per ton to extract and clean it. 4: Mining permits often displace large numbers of people who are forcibly moved and inadequately compensated. Hundreds of thousands of acres of land have been snatched away from tribal communities who lose their livelihood. 5: Corrupt mining practices also plunder the environment. Mining companies are not held sufficiently accountable for the environmental damage inflicted by them (such as gas leaks when mining petroleum) when they purchase political protection. 6: The nexus between politicians and criminals: When investigating issues like grain theft in ration shops, Kejriwal and his NGO found it very difficult to complain against criminal activity and ensure that the criminal was punished because in many cases a hefty share of the loot goes all the way to the Minister at the top. 7: Land acquisition policies work against the people’s interests in support of vested interests. Land that the government acquires often has inadequate compensation as it does not compensate for the farmer’s loss of livelihood. Land acquired for so called SEZs (Special Economic Zones) compounds this. 8: Taking away historic land use rights enjoyed by tribal communities. Tribal land was treated as an excluded area by the British. The new Indian Constitution in 1950 made these lands subject to Indian law. Families who had occupied lands for centuries did not have title deeds to their land to prove ownership. Tribals were often treated like criminals and harassed by officials. 9: Water works in cities and water rights in general are being sold to foreign companies and private contractors who profit from and make communities pay for the water that should be theirs by right. Rivers are being sold, ill-advised dams are reducing once mighty rivers to a trickle and so on. Kejriwal points out these and many other abuses of power make a sham of our democracy. He reminds us that government should be our servant. Arvind Ji cites the democratic practices of the Licchavi people in the Republic of Vaishali (where Mahavira was born in 599 BC). Even though Vaishali had a king his power was not absolute. The Grama Sabha had to ratify major decisions. Kejriwal then cites the injustice suffered by Delhi’s poor where as many as ten people live in a tiny squalid hut while the President of India lives on a 340-acre estate. Kejriwal maintains that the powers of the Village Sabha’s were undermined by the British in 1860 and given to the British Collectors. After Independence the collectors are now Indian, but the powers of the Village Sabha’s were not returned. Modern day Panchayati Raj does not give power to the people. “Panchayats have become a conduit for implementing various schemes of the government”. After citing many examples of stupid decisions by State Governments that were forced on Panchayats, Kejriwal presents two international examples of community power. In the US, a community was able to stop a Wal-Mart from coming to town. There is also an account of how “The Workers” in Brazil formed the government in Porto Agrele while discussing the budget in the streets. The author also explains how Swiss Citizens can force changes in legislation or even the constitution if 50,000 or 100,000 people respectively, write in a request. Government should also be “of the People! Arvind Kejriwal even makes the case for having teachers, officials etc. accountable for their performance. He points out that if Grama Sabha’s were given direct control over spending so that they could set priorities, waste would be reduced and that budgets could be shrunk. Small loans at critical times would free people from the clutches of money lenders, and grain storage facilities would reduce food waste (and make farmers less vulnerable to mill owners who exploit farmer penury to buy grain at throwaway prices). Arvind Ji tells of a village near Pune that runs a grain bank for farmers to deposit or borrow grain. This reduced reliance on money lenders and provided storage opportunities to farmers. Addressing the Fear of Corruption if Grama Sabha’s are empowered and are directly sent funds: Arvind Ji, says that is unlikely and explains it this way, “who will love a child more, his mother or the Secretary of Education! Hivare Bazar Village in Maharashtra: In 1989 a young M. Com student, “Popat Rao Powar” became the Sarpanch of the village. He started holding Grama Sabha’s once a week (instead of twice a year) involving all in the decision making. In 1989 the average annual income was Rs 840 a month. By 2011 it was Rs. 28,000 a year. The village now has good roads, an excellent school and a hospital. A village in North Kerala protected its trees: In the Panchayati Raj system of the state, no industry can be set up in a village unless the Grama Panchayat approves. A corporation wanted to be able to cut down the trees in the area and start a timber business. The permission to set up the factory was given by the State Minister, the Collector and even the Panchayat President but the Grama Panchayat still opposed the plan. They did not want to upset the ecology of the region by cutting down the trees. In Madhya Pradesh a new law permitted the Grama panchayat to stop the salary of an official who did not do his job properly. The village stopped the salary of school teachers who were frequently absent. In a few weeks the teachers got the message and arrived regularly for work. 1. More spending on education is likely. 2. Health Services would improve. 3. Political extremism (such as Naxalism) would reduce. 4. Empowered locals would do a better job of controlling alcoholism. 5. Freedom from hunger, poverty and unemployment. (Lower incidence). - Are atrocities against backward classes or minorities likely to increase? Individuals from the backward classes were surveyed and the consensus was that local empowerment will give them a better voice in the community. They can always complain to the Lok Pal if they are excluded and are less likely to encounter high handed officials. - Moral policing and outrages against inter-caste lovers may continue to be an issue when Grama Sabhas are empowered but community supervision will allow access to the administrative machinery (like the police) that is already in place. - Some say that poorly educated villagers are ill-qualified to take decisions. Kejriwal reminds us that when people come together in Grama Sabhas, they are better informed and learn from each other. Kejriwal explains that legislators both at the state and national level must vote on legislative issues and have the right to ask programs on various programs. They however have no real power other than determine how to spend the Rs 2 crores that is given to each MP for welfare work in their constituency. They don’t have any power as to, who will do the work, when they will be paid etc. Today even honest legislators are not allowed to function by party members above and below them. Reform is impossible without change in the political system. Shopkeepers who sell rations and kerosene oil get such a small commission (seven paise per liter for the 10,000 liters per month that they sell.) This represents an income of Rs 700 with which they could not pay their costs. They are being forced to cheat! There are 4,000 such dealers in Delhi alone. Conclusion: Arvind Kejriwal goes on to explain in detail the steps we need to take to make our governments more responsible to their electorate all the time (not just at election time). To review those recommendations, we urge that you read the actual book. N. B. The book Swaraj was written by Arvind Kejriwal before he and his associates founded the Aam Aadmi Party in 2012. 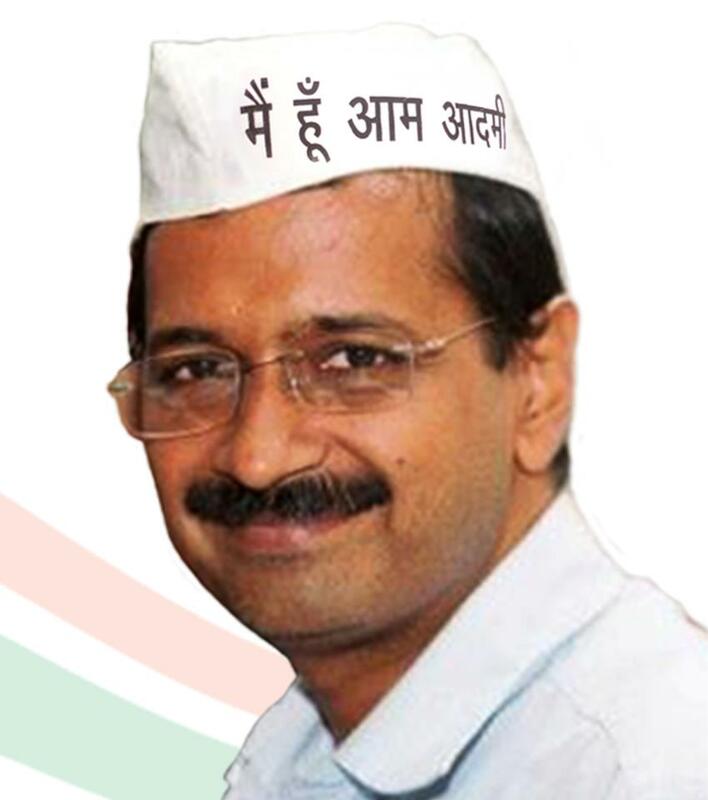 As many know, Kejriwal went on to win the legislative elections in Delhi State and become Chief Minister.